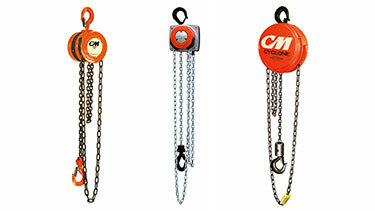 Our most popular selection of chain falls! Very simple, compact, trouble-free, low headroom, and lightweight steel construction hoist design. 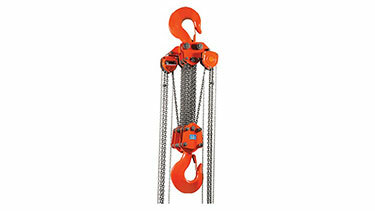 Hoist provided with hardened load chain and forged swivel hooks with latches. Cover on Hand Wheel and the load brake requires no lubrication (Weston Type). One-year warranty. Hoist manufacturer's warranty does not include on-site repairs. Customer will need to send the hoist, with freight pre-paid to EP's repair facility. 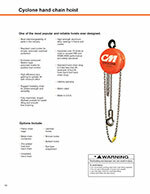 The number one chain fall choice for use on construction job sites. 1/2-ton 2255, 2208, 2231, 2263 10, 15, 20, 30 ft.
1-ton 2256, 2210, 2262, 2264 10, 15, 20, 30 ft.
2-ton 2258, 2213, 2233, 2272 10, 15, 20, 30 ft.
3-ton 2259, 2223, 2214 10, 15, 20 ft.
5-ton 2260, 2257, 2234 10, 15, 20 ft. 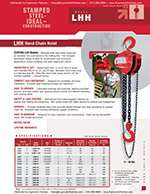 The hand chain cover rotates a full 360 degrees to allow loads to be lifted, pulled, or positioned from virtually any angle. Precision 4-pocket lift wheel and chain guide provides better chain fit and alignment which reduces wear and increases chain life. Lifetime Warranty. Hoist manufacturer's warranty does not include on-site repairs. Customer will need to send the hoist, with freight pre-paid to EP's repair facility. Alloy hardened Steel Load Chain assures high strength and long wear life. Meets ASME B30.16 & European CE Standard. Most interchangeability of parts in the industry. available in a variety of capacities from 1/4 ton to 10 tons. Standard Load Limiter for simple, automatic overload protection and enclosed contoured Weston-type automatic brake for positive load control. Rugged Hoist alloy chain for added strength and durability and high-efficiency spur gearing for greater lift with minimum effort. High-strength aluminum alloy castings in frame and covers with fully machined, forged lift wheel pockets for easier lifting and smooth free chaining. Chain containers, zinc-plated load and hand chain, aluminum unwelded hand chain, Latchlok hooks, bronze hooks, eye-type suspension, Bullard hooks and units without Load Limiter optional, depending on capacity. Made in U.S.A. Metric rated. Inspected over 75 times to meet or exceed HMI and ASME/ANSI performance and safety standards. 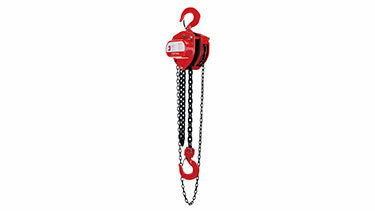 Frame - The frame of the USA Series manual chain hoist is a tough, impact resistant, lightweight, heat treated, permanent mold cast aluminum alloy. The frame is heavily proportioned, designed primarily for rigidity to hold the gears and bearings in close alignment. The frame with the covers encloses all operating parts protecting them from dirt and the weather. Capacities - 1/4 to 6 ton. 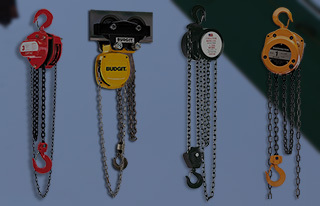 Designed for long life with minimum maintenance, the Budgit USA family of hand chain hoists' outstanding features include: lightweight, tight headroom, overload device standard, easy operation. The 1/4 through 6 ton models are of the same basic construction and consist of a cast aluminum frame which houses an automatic load brake, spur gear reduction, and load sprocket with chain guide. Suspension hook is full swiveling. Overload Device - The chain wheel, in addition to having pockets accurately formed to receive the links of the hand chain, also forms a part of a unique patent pending overload device as a standard feature. The overload device is calibrated for the capacity of the hand hoist and factory installed as an added measure of protection for the load, hoist, and operator. Gearing - The gearing is straight spur for good efficiency. The gears and pinions are generously proportioned and precision cut from alloy steel and heat treated for maximum strength and durability. All gears are grease packed in a grease tight gear case. Load Brake - The automatic, screw actuated, Weston-type load brake holds the load under all conditions and permits fine smooth control in lowering. The brake is self-adjusting with the friction washers long wearing, requiring low maintenance. Load Sprocket - The load sprocket and sprocket gear are machined from one-piece steel forging. The chain guide is a heat-treated, spring steel, flexible guide which provides heat-treated smooth surfaces that flex in the frame, controlling the load without binding. Load Chain - Closely calibrated chain links of special analysis alloy steel formed and heat-treated for unusual strength, carbonized for long wear and usage. The links are accurately formed to fit the pockets of the load sprocket. 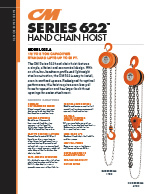 Hand Chain - The hand chain is welded steel and zinc plated for corrosion resistance and "clean hands" operation. The chain links are accurately formed to fit the pockets of the chain wheel, for gag-resistant operation in the chain wheel and guide arrangement. Hooks - The hooks are drop forged steel and are tough and ductile so that they will open noticeably when subjected to excessive overload. They are full swiveling, and each is equipped with a spring type hook latch. Spark and corrosion resistant models are designed for service in certain hazardous atmospheres and areas where resistance to friction sparks is vitally important. 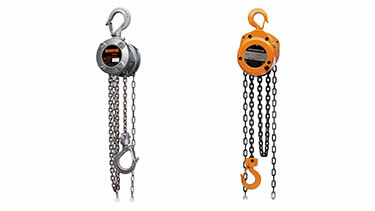 These chain fall hoist models have: bronze alloy hooks; bronze block sleeve or aluminum lower block; special chrome nickel stainless steel alloy load chains; and aluminum or bronze hand chain. 8259 1-1/2 ton 16-1/4 in. 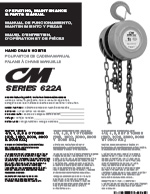 8259SR 1-1/2 ton 16-1/4 in. USA15LDP 1-1/2 ton 15.3 in. USA15LDPSR 1-1/2 ton 15.3 in. 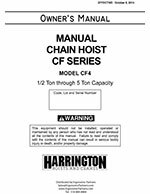 1-1/2 ton CF015-10 10 ft.
1-1/2 ton CF015-15 15 ft.
1-1/2 ton CF015-20 20 ft.
CX mini hand chain hoist is the world's smallest industrial hoist with an aluminum body and steel frame providing superior strength. Effortless to transport, install and store with a very low force required to lift loads. Grade 100, nickel-plated load chain is corrosion and wear resistant. Metal chain guide allows smooth operation. Durable stainless-steel hand chain. Lightweight and portable, the hoists are exceptionally versatile in both indoor or outdoor applications. Durable steel frame with heat treated load bearing components and rugged steel gear and hand wheel covers for impact resistance and durability. Metric capacity from 1/2-ton to 5-ton. Optional load limiter available. 4 to 1 design factor for optimum strength at all load bearing points. 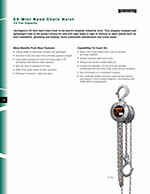 The hoist load chain is alloy steel and heat treated for strength and endurance. Hooks are forged steel and the trolley wheels are fully machined cast iron with precision ball bearings. 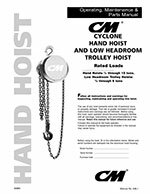 Load tested before shipment with Chester's legendary designed-in strength, reliability and durability, each model AM hoist is made in America and designed and tested to the requirements of the ANSI B30.16 specification. 150-1/4 1/4-ton 12-1/8 in. 10 ft.
150-1/2 1/2-ton 12-1/8 in. 10 ft.
150-1 1-ton 12-1/8 in. 10 ft.
150-2 2-ton 15-1/2 in. 10 ft.
150-3 3-ton 16-1/2 in. 10 ft.
150-5 5-ton 20-1/4 in. 10 ft. 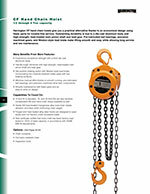 Maximum lift available on all hoists is 30 ft.
1151-1/4 1152-1/4 1/4-ton 11.125 in. 1151-1/2 1152-1/2 1/2-ton 11.125 in. 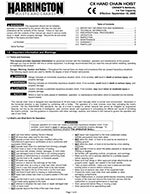 1151-1 1152-1 1-ton 11.125 in. 1151-2 1152-2 2-ton 13.687 in. 1151-3 1152-3 3-ton 15.625 in. 1151-5 1152-5 5-ton 18.312 in. Compact gear housing provides low headroom. Portable and easy to install. Designed to easily dismantle with simple hand tools. Lubricated bearings and bushings, bearing-mounted pinions, and heat-treated spur gearing for smooth and efficient operation. Lifetime warranty. Stamped steel housing withstands rugged conditions. 360° swivel hooks with safety latches for positive load engagement. 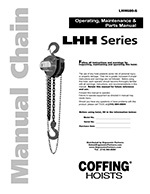 LHH-1/2B-10 08903W 1/2-ton 10 ft.
LHH-1/2B-15 08904W 1/2-ton 15 ft.
LHH-1/2B-20 08905W 1/2-ton 20 ft.
LHH-1B-10 08910W 1-ton 10 ft.
LHH-1B-15 08911W 1-ton 15 ft.
LHH-1B-20 08912W 1-ton 20 ft.
LHH-11/2B-10 08921W 1-1/2 ton 10 ft.
LHH-11/2B-15 08922W 1-1/2 ton 15 ft.
LHH-11/2B-20 08923W 1-1/2 ton 20 ft.
LHH-2B-10 08917W 2-ton 10 ft.
LHH-2B-15 08918W 2-ton 15 ft.
LHH-2B-20 08919W 2-ton 20 ft.
LHH-3B-10 08925W 3-ton 10 ft.
LHH-3B-15 08926W 3-ton 15 ft.
LHH-3B-20 08927W 3-ton 20 ft.
LHH-5B-10 08932W 5-ton 10 ft.
LHH-5B-15 08933W 5-ton 15 ft.
LHH-5B-20 08934W 5-ton 20 ft.
Chester Zephyr hoists are the Cadillac of manually operated chain falls and have been used in some of the most grueling industries including offshore drilling, mining, and military operations. These hoists have the lowest headroom in the industry and are available in spark and corrosion resistant models designed for service in hazardous atmospheres and areas where resistance to friction sparks is vitally important. Zephyr Hoists can be configured for special applications. Ergonomic Partners provides manual chain hoists and other services; serving clients from coast to coast, Canada, Mexico and especially focused in the states of Missouri, Illinois, Indiana, Kansas, Arkansas, Mississippi, Nebraska, Tennessee, Kentucky, Iowa, and Oklahoma.